It was a bit more of a rush than I had hoped for. 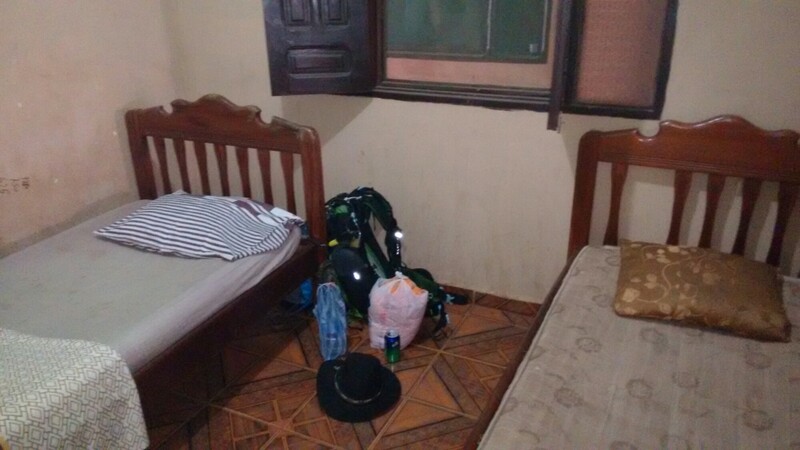 My attempts to explain to Julio that there was no point getting off the boat upon our 2AM arrival at Porto Velho, as there were no buses till 6:30, were fraught with difficulty. I had thought this had been sorted out the day before, but apparently not. When it came to leaving for that first bus though, our taxi speeding through town combined with an impatient ticket attendant had us scraping onto the bus by the skin of our teeth. Who knew organisation in Spanish was so difficult? I spent a grand total of 15 minutes in Porto Velho itself. 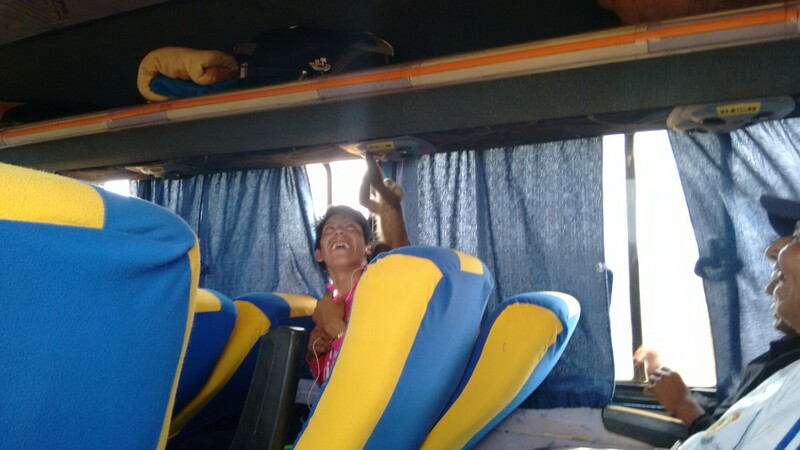 Wed hoped our bus would lean toward the shorter of the 4 1/2 to six hour estimated journey time to Guayara-mirim, on the Bolivian border, but as we leapt off and dashed into a taxi to the Policia Federal we discovered we were moments too late. It was five past twelve, and like everywhere else, the office for our very necessary Brazilian exit stamps was closed till two. After an hour speaking to a South African missionary (a real one, not like me), where for once it was Julio feeling left out of the conversation, we got our exit stamps and sped over the river border to Bolivia. 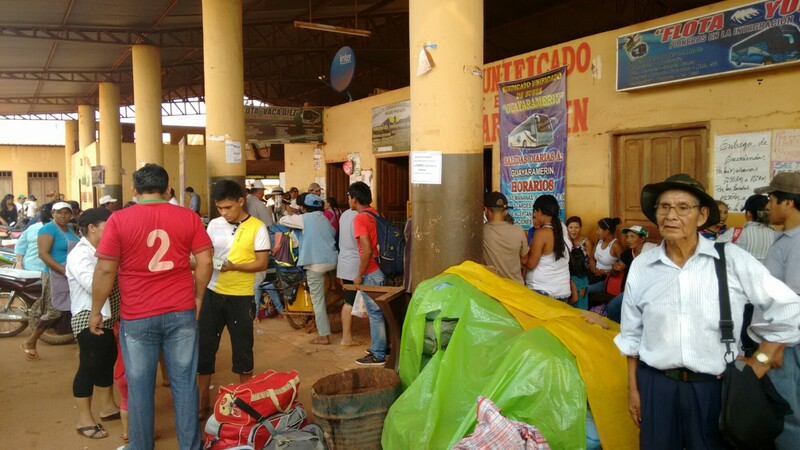 Arriving in Guayaramerin, the town wasn’t nearly as dark and grotty as I had expected of the remote border town. After changing my money (a much more simple affair than it had been in arriving in Brazil) I waited as Julio disappeared to see if he could book a flight to La Paz and organise our future plans. 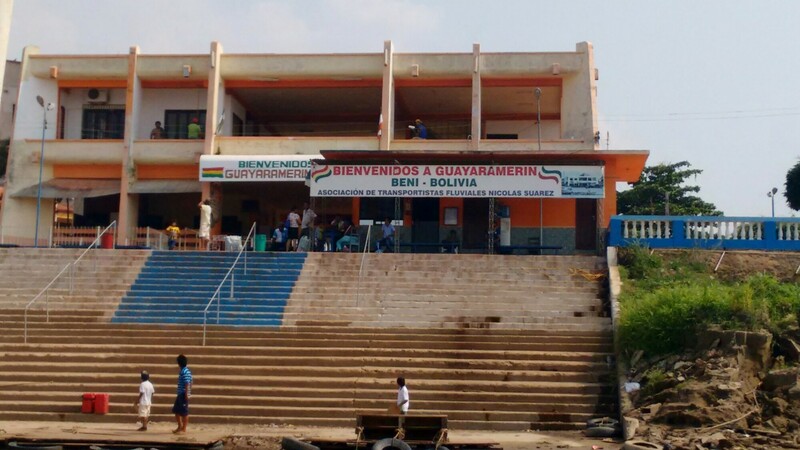 He returned with bad news though; I would be unable to get a bus to Rurrenabaque that day (my readjusted plan for Bolivia – I had originally planned to travel to Trinidad), and would have to wait till the next morning. This money changing lark is a doddle. Taking care of plans a little more than I would have wished, Julio made a deal for us to stay somewhere in a twin bedroom for 25 bolivianos each. I was pretty sceptical. To bring it into perspective, that equates to £2.50 a person. Even for Bolivia that is cheap. Having been six days since I left Manaus now, I would much rather have paid a bit more in the suspicion it would ensure better quality, but I’ll let you try telling a Chilean guy with no English that you’d rather pay more for a room. The hotel. Looks ok, right? Our method of transport was also part of Julio’s arrangement. The mototaxi. I wasn’t convinced when I got on, wielding multiple bags and a hammock along with my trusty Manaus bought Stetson, and not much more convinced by the time I got off. We zipped around streets and past blind junctions, the urge to stay on so great that I held on as you would a horse, thighs clamped down as tight as possible. Optimism abounded as I alighted. There were only trips to the Bolivian Policia Federal, the bus station and back to the hotel to go. After the (admittedly much more more fun without baggage) additional mototaxi trips I returned to the hotel. After finding that we could only get separate rooms for 30 bolivianos each (shock, horror!) I inspected mine to find it was, unsurprisingly, pretty dreary. Actually, that’s the nice way of putting it. 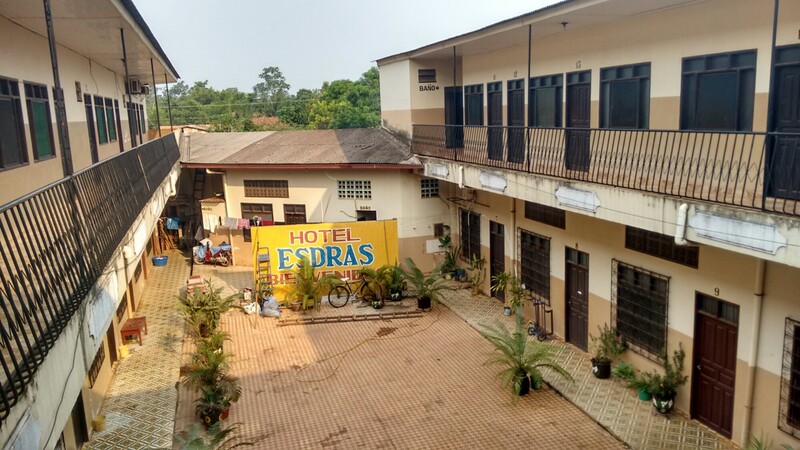 It was actually pretty disgusting; stains of unknown origin and writing on the walls, a pretty dodgy smell and a mattress that I could only pray didn’t have bedbugs were only some of the issues. I would sleep in my sleeping liner, and even then, fitfully. On the brighter side, the hour or so before nightfall allowed me to buy some pastries and fruit for the coming trip, discover that Bolivia doesn’t have any other biscuits aside from crackers and wafers (do those even count?) and get dinner for 10 bolivianos. It didn’t even make me ill! Not the most pleasant place I’ve stayed. Also, why are there two beds? We were told twin rooms weren’t available! Come morning it was time to say goodbye to Julio – he was still waiting to see if he could get a flight – and get the bus. I could only hope I was well enough prepared and stocked up for what the guidebook helpfully declared was an 18 hour to three day journey. My would be companion for the forthcoming journey. The bus from Guayaramerin to Rurrenabaque (or I guess all the way to La Paz if you’re a masochist) is a confusing journey. An hour and a half into the journey and you arrive at Riberalta, a town that noone seems to travel to and doesn’t look very appealing. Being 90 minutes into the journey, you expect a short stop to go to the toilet, maybe even a stop where you can’t get off the bus. That is what I expected. Especially when I asked the bus driver how long it would be, sure he had said “Onze minutos”, or eleven minutes in other words. That was at ten past ten. As we ticked past eleven o’clock, I assumed that I had just misheard, and he said said “Onze horas”, bus we continued to sit there. We didn’t leave till 12:50. Two hours and forty minutes later. 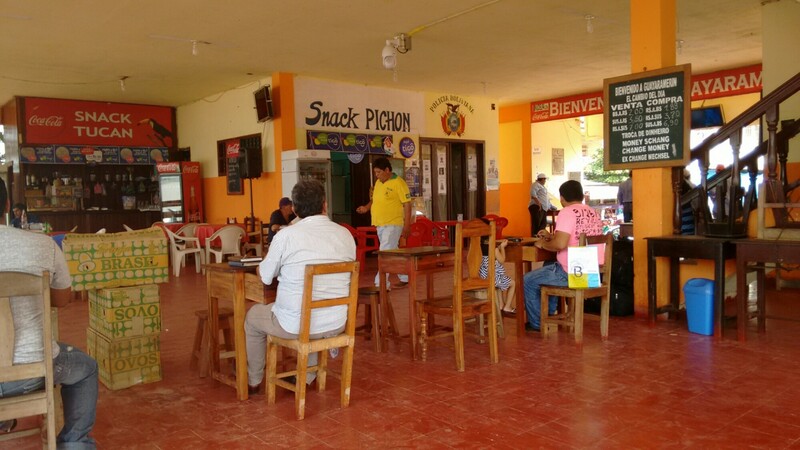 Riberalta bus station. A hive of activity, and then boredom. At this point I could only conclude that this must be the sort of bus that must stop fairly frequently. Again, I could not have been more wrong. Our next stop was five hours later, not though for food or a toilet break, but because there was a queue. On this most unused if roads, a queue. As everybody got off the bus and inspected the lorries ahead, it transpired that noone was able to pass the river beyond, but for what reason noone knew. Rumours circulated, some that we would be able to leave within a few hours, most that we were stuck till morning. As the sun set, the panicked moans of “Agua, agua” could be heard across the dusty plains. The moans carried across the plains. For hours. At the time it really was worrying. I hadn’t restocked my water, assuming that the three litres I’d had leaving Riberalta would be sufficient. They weren’t. When I awoke from my fitful, thirst ridden sleep at 1AM, to find we had set off again, the relief was palpable. We still had to wait until 5:30AM before the bus stopped to allow us to get provisions. Aside from this though, the bus wasn’t all bad. We had ample entertainment from a little girl’s monkey, who kept jumping around the bus and climbing over everyone. At one point he dragged a box of tiny, cheeping chicks out from under a Bolivian lady’s skirt and proceeded to turn it upside down. I assume even for Bolivians this isn’t a regular occurrence, as everybody was in stitches. It was amazing how well trained he was though, hopping back into the girls arm whenever called. I also got a grilling from two girls on the bus, including the aforementioned, who got very frustrated at my limited ability to answer their questions. This, nevertheless didn’t prevent them from asking the same ones over and over and over. Their favourite was to ask if I had movies on my Kindle. Despite me saying it didn’t, and showing them, apparently this was not an acceptable answer. My Kindle was requisitioned for testing. Eventually, the journey had to end. 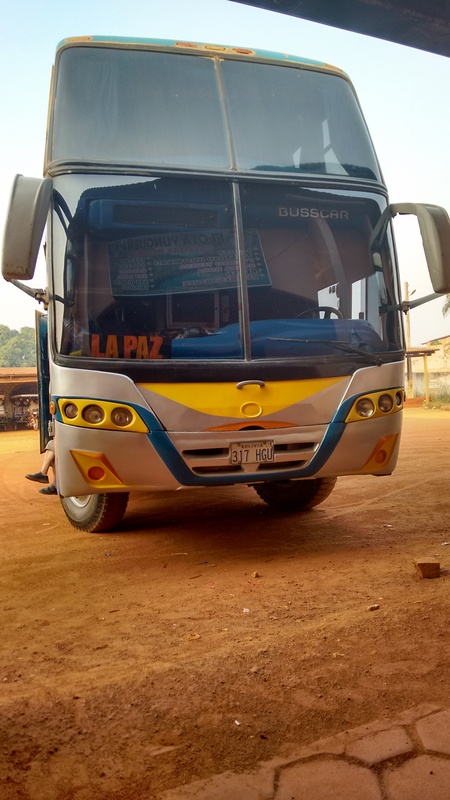 After a slight hiccup when I got off after a man told me we were at Rurrenabaque (we were at Santa Maria), we eventually pulled up at the bus station at half past eight. 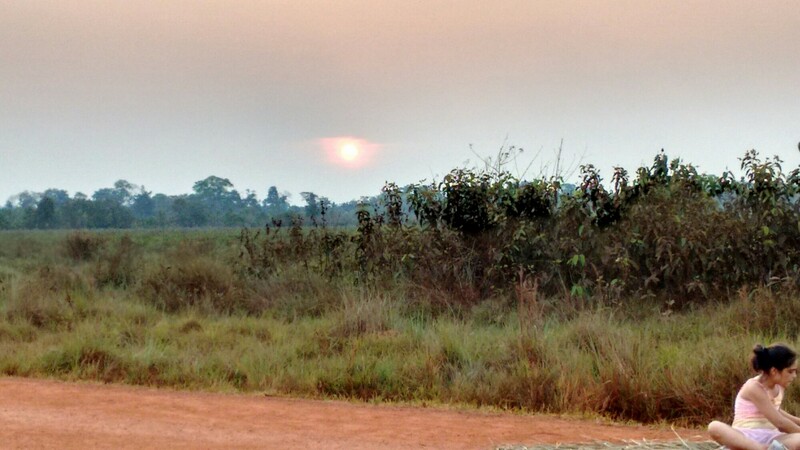 Only twenty four hours after I set off from Guayaramerin, and seven days since my last real stop in Manaus. For a journey that Lonely Planet states can take 18 hours to three days, I guess I should be grateful. It’s Santa Maria! Or maybe one of the many other small towns that look exactly the same? One lightning quick mototaxi later (over cobbles, which is really scary) I arrived at Hotel Oriental, which would be my home for the next few days. And what a lazy home it would be. 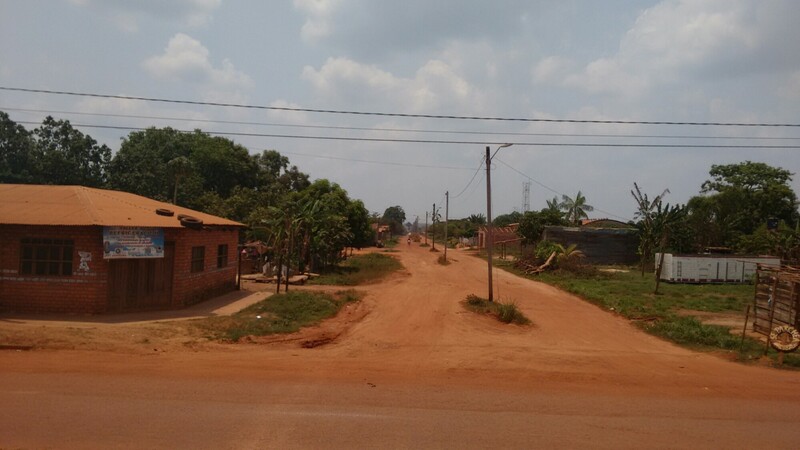 Border Crossing, Bus Travel, Dodgy Places to Stay, Isolated Places, Language Issues, Mototaxi, September 2015. Bookmark.